It's hard to imagine that a year ago, I thought I hated Greek Yogurt. I am a girl with texture issues - I dislike scallops and raw tomatoes due to texture reasons only. At one point in my life, Greek Yogurt fell into that category. After I moved to Tampa, Keri came to visit and bought Greek Yogurt to make parfaits for breakfast. I turned my nose up to it, watching her make a beautiful yogurt, raspberry and granola breakfast. Finally, I broke down and tried it to realize that I really liked Greek Yogurt! I learned that adding crunch to the yogurt initially helped me with the texture issue. Today, I can eat the yogurt straight. Not only is Greek Yogurt my go to breakfast staple, I also cook with it. We go through a 32oz container of plain Greek yogurt a week. I use it in place of sour cream, buttermilk, heavy cream, mayonnaise and much more. Here is a handy chart from the Chobani Kitchen. When Chobani offered to send me a cooler full of product, I didn't know what I would expect to find on my doorstep. I am normally not a flavored Greek Yogurt person, the most unadventurous I get is Vanilla. When my UPS man dropped of a box from Chobani on Friday night, he called me his Job security which got a giggle out of me. I opened the box, to find a aluminum cool bag, which I will be re-using. Now it's like a Chobani Christmas in my house, what will I get? Upon opening the box, I saw a huge variety of flavors. Black Cherry, Blood Orange (!! ), Pineapple, Strawberry, Apple Cinnamon (YUM), Pear, Banana, Mango, Strawberry Banana, Blueberry, Plain and Peach. Of the flavors, I got super excited about the 0% Apple Cinnamon. It was the first one I tried of the group, I had it for breakfast and I loved every moment of it. The second one which caught my eye was 0% blood orange. Oh my -It tasted exactly like a creamsicle. I added chocolate chips to it and I now have a favorite Chobani flavor. 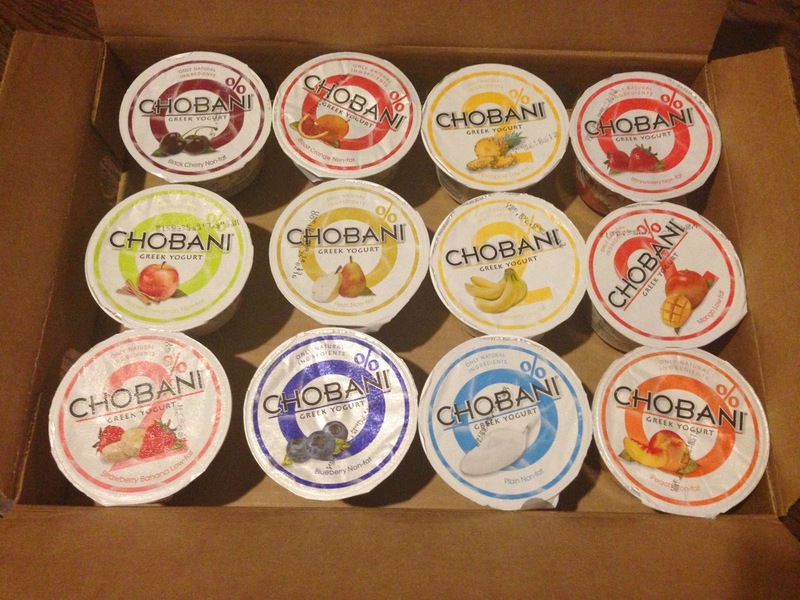 Chobani wants to give you a 12 pack cooler packed full of their goodies too! I want to know if you substitute Greek Yogurt in cooking. 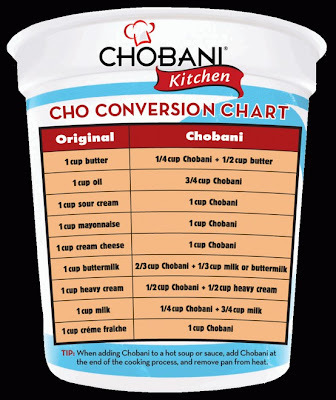 Chobani offers many delicious recipes on their website. A few of my favorites are featured below using the flavors I received in the package. Leave me a comment letting me know what you would make at home if you won the prize pack. After leaving your comment, make sure you enter on Rafflecopter as that is how I select my winner. If you are unsure how to use Rafflecopter, click here for a quick video explaining how to use it. 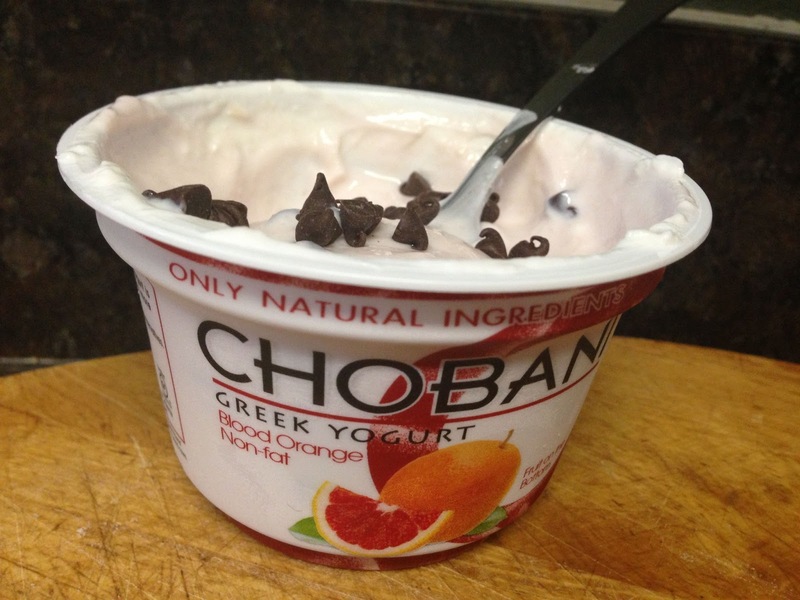 I used to hate yogurt until I found Chobani! I love using it in smoothies, but I've always wanted to try to make a veggie dip with the plain yogurt! It'd be so much healthier than ranch! I've never thought to cook with yogurt! I LOVE Pineapple Upside Down cake, so that sounds amazing!! Oh you must give it a try! I use it so often in place of heavier fatty creams. I would love to try those hush puppies out! I eat Greek Yogurt every morning. The hush puppies look awesome and would make a great Superbowl snack. I think id make the Black Forest Cupcakes using Black Cherry! I love greek yogurt and eat it all the time! I love love love love love Greek Yogurt. I think I should win since I introduced you to it. I can't fix contests, lol! You are pretty lucky though being you were one of 1,000+ to win the Guacamole contest. Chobani is great, in fact I'm interviewing with them for a job right now. Good luck on your interview!!!! My favorite is to use Chobani to make Indian food. me too Alicia! I made Butter Chicken last night and used the plain 0%. I'd make a smoothie with the blood orange flavor! The pineapple upside down cake looks amazing, love this yogurt so much! That mango lentil soup sounds so good! I would probably eat it as is, but I would like to try the pineapple upside down cake. I <3 Chobani! I have Chobani in my fridge right now! I'm using it make a sauce for Shrimp Tacos! I make green machine smoothies! I tried another brand of greek yogurt about two years ago and did not like it. It was very tart and my mom has told me about Chobani but I have yet to try it. The variety of flavors definitely has me interested!! I love Greek Yogurt! I mix in some or all of these: cocoa, cacao, chocolate shavings, coconut shreds, cacao nibs, cinnamon, almonds. Sadly, it is very near impossible to find full fat yogurt. Usually the best I can do is 2%. That's ok, just add in more healthy fats of your choosing! i would make a banana bread loaf! Those black forest cupcakes look good - maybe I'd try them. I wouldn't be able to make anything because it will be gone right away! My son loves it! I LOVE greek yogurt! I always use it as a healthy alternative when cooking and baking. I would love to get my hands on some pineapple chobani to make pineapple upside down cake - one of my favorite desserts! I would use it in some banana nut bread! I would make some protein fruit smoothies for after my gym workouts! Some baked goods with Chobani would be yummy! I'd like to try some blueberry muffins and banana nut bread too! I have a recipe using the pineapple flavor as a chicken marinade. It's fantastic. I also like to use yogurt instead of butter or oil in my quick breads. Thanks again to you for hosting the giveaway and to Chobani!